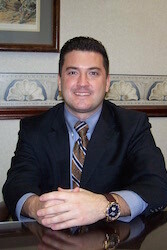 Attorney Luiz grew up in Dartmouth and has strong ties to the South Coast community. He received his Associate’s Degree from Bristol Community College and was awarded an academic scholarship to attend the University of Massachusetts - Boston under the Foster Furculo Scholarship Program. After receiving his Bachelor's Degree, Russell worked in youth services before starting law school. Russell attended law school in his home town at the University of Massachusetts School of Law. Russell was among the first entering class of the University of Massachusetts School of Law and was an active member of the student government. During law school, Russell had several internships including working for the Bristol County District Attorney's Office in Fall River. He was also his law school's American Bar Association Liaison and tutored entering law students as a Dean's Fellow. Attorney Luiz remains an active member of the South Coast community and stays actively involved with his law school.